Humans have been sending spacecraft to other planets, as well as asteroid and comets, for decades. But rarely have any of these ventured into the outer reaches of our Solar System. In fact, the last time a probe reached beyond the orbit of Saturn to explore the worlds of Neptune, Uranus, Pluto and beyond was with the Voyager 2 mission, which concluded back in 1989. But with the New Horizons mission, humanity is once again peering into the outer Solar System and learning much about its planets, dwarf planets, planetoids, moons and assorted objects. And as of July 14th, 2015, it made its historic rendezvous with Pluto, a world that has continued to surprise and mystify astronomers since it was first discovered. In 1980, after Voyager 1‘s flyby of Saturn, NASA scientists began to consider the possibility of using Saturn to slingshot the probe towards Pluto to conduct a flyby by 1986. This would not be the case, as NASA decided instead to conduct a flyby of Saturn’s moon of Titan – which they considered to be a more scientific objective – thus making a slingshot towards Pluto impossible. Because no mission to Pluto was planned by any space agency at the time, it would be years before any missions to Pluto could be contemplated. However, after Voyager 2′s flyby of Neptune and Triton in 1989, scientists once again began contemplating a mission that would take a spacecraft to Pluto for the sake of studying the Kuiper Belt and Kuiper Belt Objects (KBOs). In May 1989, a group of scientists, including Alan Stern and Fran Bagenal, formed an alliance called the “Pluto Underground”. Committed to the idea of mounting an exploratory mission to Pluto and the Kuiper Belt, this group began lobbying NASA and the US government to make it this plan a reality. Combined with pressure from the scientific community at large, NASA began looking into mission concepts by 1990. 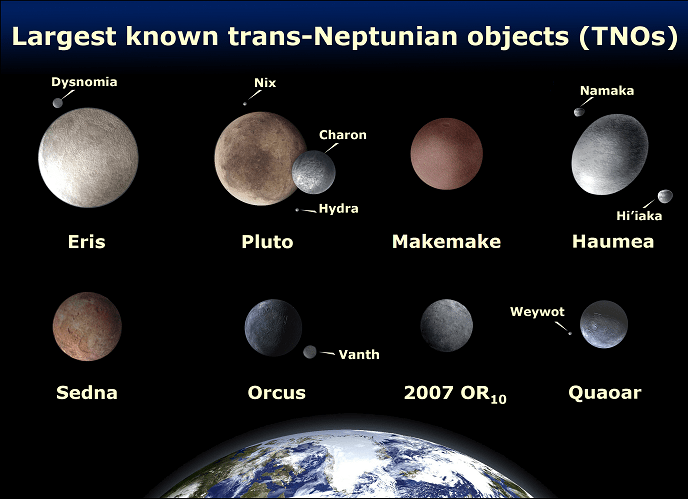 During the course of the late 1990s, a number of Trans-Neptunian Objects (TNOs) were discovered, confirming the existence of the Kuiper Belt and spurring interest in a mission to the region. This led NASA to instruct the JPL to re-purpose the mission as a Pluto and KBO flyby. However, the mission was scrapped by 2000, owing to budget constraints. Backlash over the cancellation led NASA’s Science Mission Directorate to create the New Frontiers program which began accepting mission proposals. Stamatios “Tom” Krimigis, head of the Applied Physics Laboratory’s (APL) space division, came together with Alan Stern to form the New Horizons team. Their proposal was selected from a number of submissions, and officially selected for funding by the New Frontiers program in Nov. 2001. Despite additional squabbles over funding with the Bush administration, renewed pressure from the scientific community allowed the New Horizons team managed to secure their funding by the summer of 2002. With a commitment of $650 million for the next fourteen years, Stern’s team was finally able to start building the spacecraft and its instruments. New Horizons was planned as a voyage to the only unexplored planet in the Solar System, and was originally slated for launch in January 2006 and arrival at Pluto in 2015. Alan Stern was selected as the mission’s principal investigator, and construction of the spacecraft was handled primarily by the Southwest Research Institute (SwRI) and the Johns Hopkins Applied Physics Laboratory, with various contractor facilities involved in the navigation of the spacecraft. Meanwhile, the US Naval Observatory (USNO) Flagstaff Station – in conjunction with NASA and JPL – was responsible for performing navigational position data and related celestial frames. Coincidentally, the UNSO Flagstaff station was where the photographic plates that led to the discovery of Pluto’s moon Charon came from. In addition to its compliment of scientific instruments (listed below), there are several cultural artifacts traveling aboard the spacecraft. These include a collection of 434,738 names stored on a compact disc, a piece of Scaled Composites’s SpaceShipOne, and a flag of the USA, along with other mementos. In addition, about 30 g (1 oz) of Clyde Tombaugh’s ashes are aboard the spacecraft, to commemorate his discovery of Pluto in 1930. Alice: An ultraviolet imaging spectrometer responsible for analyzing composition and structure of Pluto’s atmosphere and looks for atmospheres around Charon and Kuiper Belt Objects (KBOs). LORRI: (Long Range Reconnaissance Imager) a telescopic camera that obtains encounter data at long distances, maps Pluto’s farside and provides high resolution geologic data. PEPSSI: (Pluto Energetic Particle Spectrometer Science Investigation) an energetic particle spectrometer which measures the composition and density of plasma (ions) escaping from Pluto’s atmosphere. Ralph: A visible and infrared imager/spectrometer that provides color, composition and thermal maps. REX: (Radio Science EXperiment) a device that measures atmospheric composition and temperature; passive radiometer. SDC: (Student Dust Counter) built and operated by students, this instrument measures the space dust peppering New Horizons during its voyage across the solar system. SWAP: (Solar Wind Around Pluto) a solar wind and plasma spectrometer that measures atmospheric “escape rate” and observes Pluto’s interaction with solar wind. Due to a series of weather-related delays, the New Horizons mission launched on January 19th, 2006, two days later than originally scheduled. The spacecraft took off from Cape Canaveral Air Force Station, Florida, at 15:00 EST (19:00 UTC) atop an Atlas V 551 rocket. This was the first launch of this particular rocket configuration, which has a third stage added to increase the heliocentric (escape) speed. The spacecraft left Earth faster than any spacecraft to date, achieving a launch velocity of 16.5 km/s. It took only nine hours to reach the Moon’s orbit, passing lunar orbit before midnight (EST) on the same day it was launched. It has not, however, broken Voyager 1‘s record – which is currently traveling at 17.145 km/s (61,720 km/h, 38,350 mph) relative to the Sun – for being the fastest spacecraft to leave the Solar System. Between January and March, 2006, mission controllers guided the probe through a series of trajectory-correction maneuvers (TCMs). During the week of February 20th, 2006, controllers conducted in-flight tests on three of the major on board science instruments. On April 7th, the spacecraft passed the orbit of Mars, moving at roughly 21 km/s (76,000 km/h; 47,000 mph) away from the Sun. At this point in its journey, the spacecraft had reached a distance of 243 million kilometers from the Sun, and approximately 93.4 million km from Earth. On June 13th, 2006, the New Horizons spacecraft passed the tiny asteroid 132524 APL at a distance of 101,867 km (63,297 mi) when it was closest. Using the Ralph instrument, New Horizons was able to capture images of the asteroid, estimating to be 2.5 km (1.6 mi) in diameter. The spacecraft also successfully tracked the asteroid from June 10th-12th, 2006, allowing the mission team to test the spacecraft’s ability to track rapidly moving objects. From September 21st-24th, New Horizons managed to capture its first images of Pluto while testing the LORRI instruments. These images, which were taken from a distance of approximately 4,200,000,000 km (2.6×109 mi) or 28.07 AU and released on November 28th, confirmed the spacecraft’s ability to track distant targets. On September 4th, 2006, New Horizons took its first pictures of Jupiter at a distance of 291 million kilometers (181 million miles). The following January, it conducted more detailed surveys of the system, capturing an infrared image of the moon Callisto, and several black and white images of Jupiter itself. By February 28th, 2007, at 23:17 EST (03:17, UTC) New Horizons made its closest approach to Europa, at a distance of 2,964,860 km (1,842,278 mi). At 01:53:40 EST (05:43:40 UTC), the spacecraft made its flyby of Jupiter, at a distance of 2.3 million km (1.4 million mi) and received a gravity assist. The Jupiter flyby increased New Horizons‘ speed by 4 km/s (14,000 km/h; 9,000 mph), accelerating the probe to a velocity of 23 km/s (83,000 km/h; 51,000 mph) relative to the Sun and shortening its voyage to Pluto by three years. The encounter with Jupiter not only provided NASA with the opportunity to photograph the planet using the latest equipment, it also served as a dress rehearsal for the spacecraft’s encounter with Pluto. As well as testing the imaging instruments, it also allowed the mission team to test the communications link and the spacecraft’s memory buffer. One of the main goals during the Jupiter encounter was observing its atmospheric conditions and analyzing the structure and composition of its clouds. Heat-induced lightning strikes in the polar regions and evidence of violent storm activity were both observed. In addition, the Little Red Spot, was imaged from up close for the first time. The New Horizons spacecraft also took detailed images of Jupiter’s faint ring system. Traveling through Jupiter’s magnetosphere, the spacecraft also managed to collect valuable particle readings. The flyby of the Jovian systems also gave scientists the opportunity to examine the structure and motion of Io’s famous lava plumes. New Horizons measured the plumes coming from the Tvashtar volcano, which reached an altitude of up to 330 km from the surface, while infrared signatures confirmed the presence of 36 more volcanoes on the moon. Callisto’s surface was also analyzed with LEISA, revealing how lighting and viewing conditions affect infrared spectrum readings of its surface water ice. Data gathered on minor moons such as Amalthea also allowed NASA scientists to refine their orbit solutions. After passing Jupiter, New Horizons spent most of its journey towards Pluto in hibernation mode. During this time, New Horizons crossed the orbit of Saturn (June 8, 2008) and Uranus on (March 18, 2011). In June 2014, the spacecraft emerged from hibernation and the team began conducting instrument calibrations and a course correction,. By August 24th, 2014, it crossed Neptune’s orbit on its way to Pluto. Investigators compiled a series of images of the moons Nix and Hydra taken from January 27th through February 8th, 2015, beginning at a range of 201,000,000 km (125,000,000 mi), while Kerberos and Styx were captured by photos taken on April 25. On July 4th, 2015, NASA lost contact with New Horizons after it experienced a software anomaly and went into safe mode. On the following day, NASA announced that they had determined it to be the result of a timing flaw in a command sequence. By July 6th, the glitch had been fixed and the probe had exited safe mode and began making its approach. The New Horizons spacecraft made its closest approach to Pluto at 07:49:57 EDT (11:49:57 UTC) on July 14th, 2015, and then Charon at 08:03:50 EDT (12:03:50 UTC). Telemetries confirming a successful flyby and a healthy spacecraft reached Earth on 20:52:37 EDT (00:52:37 UTC). With its flyby of Pluto now complete, the New Horizons probe is now on its way towards the Kuiper Belt. The goal here is to study one or two other Kuiper Belt Objects, provided suitable KBOs are close to New Horizons‘ flight path. Three objects have since been selected as potential targets, which were provisionally designated PT1 (“potential target 1”), PT2 and PT3 by the New Horizons team. These have since been re-designated as 2014 MU69 (PT1), 2014 OS393 (PT2), and 2014 PN70 (PT3). All of these objects have an estimated diameter of 30–55 km, are too small to be seen by ground telescopes, and are 43–44 AU from the Sun, which would put the encounters in the 2018–2019 period. All are members of the “cold” (low-inclination, low-eccentricity) classical Kuiper Belt, and thus very different from Pluto. Even though it was launched far faster than any outward probe before it, New Horizons will never overtake either Voyager 1 or Voyager 2 as the most distant human-made object from Earth. But then again, it doesn’t need to, given that what it was sent out to study all lies closer to home. What’s more, the probe has provided astronomers with extensive and updated data on many of planets and moons in our Solar System – not the least of which are the Jovian and Plutonian systems. And last, but certainly not least, New Horizons is the first spacecraft to have it made it out to such a distance since the Voyager program. And so we say so long and good luck to New Horizons, not to mention thanks for providing us with the best images of Pluto anyone has ever seen! We can only hope she fares well as she makes its way into the Kuiper Belt and advances our knowledge of the outer Solar System even farther. We have many interesting articles about the New Horizons spacecraft and Pluto here on Universe Today. For example, here are some Interesting Facts About Pluto, How Long Does it Take to Get to Pluto, Why Pluto is No Longer Considered a Planet, and Is There Life on Pluto? For more information on the Kuiper Belt, check out What is The Kuiper Belt? and NASA’s Solar System Exploration entry on the Kuiper Belt and Oort Cloud. And be sure to check out the New Horizons mission homepage at NASA. It’s possible that if we do eventually observe the hypothetical objects that make up the hypothetical Oort cloud, they will all be a deep red color. This red coloring will probably be a mix of ices, richly laced with organic compounds – and may represent remnants of the primordial material from which the solar system was formed. Furthermore, the wide range of colors found across different classes of trans-Neptunian objects may help to determine their origins. The current observable classes of trans-Neptunian objects includes Pluto and similar objects called plutinos, which are caught in a 2:3 orbital resonance with Neptune towards the inner edge of the Kuiper belt. There are other Kuiper belt objects caught in a range of different resonant orbital ratios, including two-tinos – which are caught in a 1:2 resonance with Neptune – and which are found towards the outer edge of the Kuiper belt. Otherwise, the majority of Kuiper belt objects (KBOs) are cubewanos (named after the first one discovered called QB1), which are also known as ‘classical’ KBOs. These are not obviously in orbital resonance with Neptune and their solar orbits are relatively circular and well outside Neptune’s orbit. There are two fairly distinct populations of cubewanos – those which have little inclination and those which are tilted more than 12 degrees away from the mean orbital plane of the solar system. Beyond the Kuiper belt is the scattered disk – which contains objects with very eccentric elliptical orbits. So, although it may take hundreds of years for them to get there, the perihelions of many of these objects’ orbits are much closer to the Sun – suggesting this region is the main source of short period comets. The trans-Neptunian landscape. Classical Kuiper belt objects have relatively circular orbits that never stray within the orbit of Neptune (yellow circle) - while plutinos and scattered disk objects have eccentric orbits that may. Classical objects with low inclinations (see ecliptic view) tend to have the deepest red coloration. Objects with higher inclination - and those with eccentric solar orbits which take them closer to the Sun - appear faded. Plutinos, scattered disk objects and highly inclined cubewanos are much less red. Beyond the scattered disk are detached objects, that are clearly detached from the influence of the major planets. The best known example is Sedna – which is… yep, deep red (or ultra-red as the boffins prefer to say). Sedna and other extreme outer trans-Neptunian objects are sometimes speculatively referred to as inner Oort cloud objects. So if we are willingly to assume that a few meager data points are representative of a wider (and hypothetical) population of Oort cloud objects – then maybe, like Sedna, they are all a deep red color. And, looking back the other way, the ‘much less red’ color of highly inclined and highly eccentric trans-Neptunian objects is consistent with the color of comets, Centaurs (comets yet to be) and damocloids (comets that once were). On this basis, it’s tempting to suggest that deep red is the color of primordial solar system material, but it’s a color that fades when exposed to moderate sunlight – something that seems to happen to objects that stray further inward than Neptune’s orbit. So maybe all those faded objects with inclined orbits used to exist much nearer to the Sun, but were flung outward during the early planetary migration maneuvers of the gas giants. And the primordial red stuff? Maybe it’s frozen tholins – nitrogen-rich organic compounds produced by the irradiation of nitrogen and methane. And if this primordial red stuff has never been irradiated by our Sun, maybe it’s a remnant of the glowing dust cloud that was once our Sun’s stellar nursery. Ah, what stories we can weave with scant data. Further reading: Sheppard, S.S. The colors of extreme outer solar system objects.